For OpenVis Conf 2016, we had the wonderful opportunity of offering workshops to conference goers. In collaboration with my amazingly talented coworker, Yannick Assogba, we created a brand new, full day, text analysis and visualization workshop. It was a lot of hard work, but it was all worth it. For one magical day, we overcame internet difficulties and hurdled bad IT policy to provide an experience that impacted deeply my teaching approach and was universally enjoyed by our 30+ attendees. The workshop content is available here. We started with A series of Jupyter notebooks that familiarized everyone with the basics of working in a iterative notebook environment. We covered the basics of notebook use and of python - in case folks were unfamiliar. Then we dove into text analysis, starting at the sentence level and working our way up to corpora. 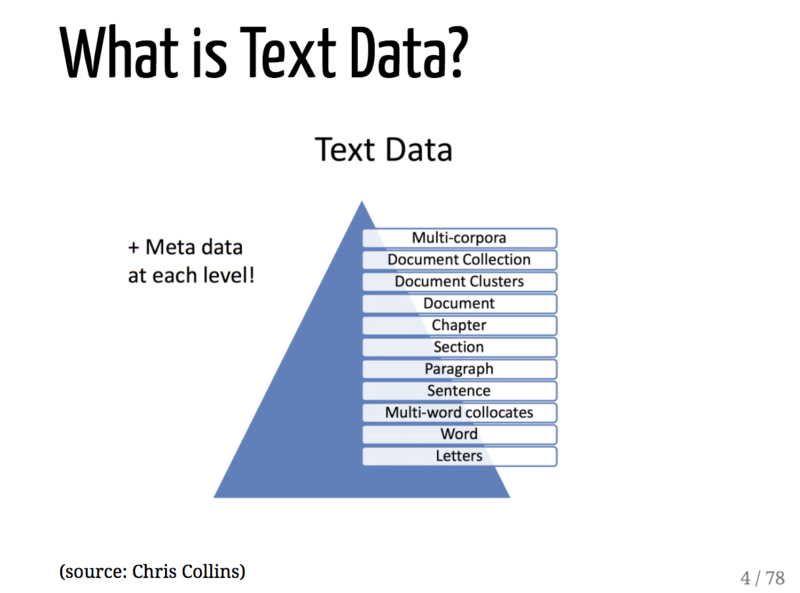 We looked at how to turn raw text into data, and a number of different metrics useful for understanding and visualizing the text. Attendees each copied these notebooks to their machines, and used them as starting points for hands-on exercises throughout the morning. After learning ‘enough to be dangerous’ about text analysis methods, we jumped over to the visualization side of things. Yannick and I gave a short intro to D3 and Processing.js before diving into an exploration of text visualization examples. The content for this presentation was organized based on visual encoding strategies of the text visualization methods. The day ended with a short collaborative hackathon. Small groups were formed based on common interests and we all got to work building our own text visualizations. The results were impressive! Even after a full day of workshopping, the amount of interaction and the progress made by the teams was far more than I expected. It was a great day, and I believe from the reviews and the interactions I’ve had since then that folks really enjoyed it. After the conference, I truncated this workshop into a talk around text analysis and visualization methods and presented it to a visualization class at the University of Washington iSchool, hosted by Mike Freeman. The material is probably more suited to the workshop experience - but at least the visualization examples are interesting!